We are spending a few days in the bathrooms of our homes this week. The bathroom is usually one of the busiest and smallest room in the house, so it is imperative that we declutter and organize that space. We live in a ranch style house with only one bathroom for eight people. If I don’t keep the bathroom free of clutter, I will find myself going crazy. We will soon be building an additional bathroom, but for now I need to do the best with what I have. 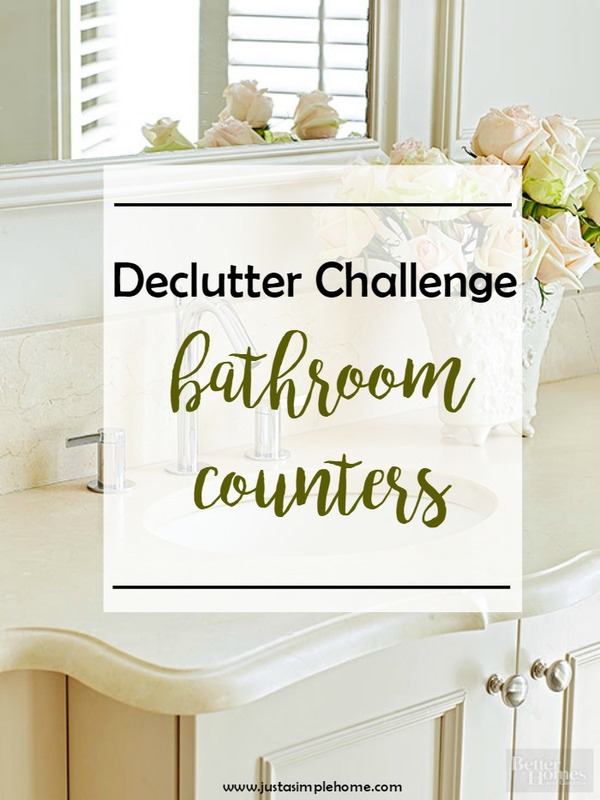 Gather all items from your bathroom counters. Wipe down counters so you have a clean surface. Throw away any items you no longer use, or that have broken. Most things do not have to remain on your counters. Think about putting items in drawers or labeled bins in your linen closet. Hair accessories are a good thing to keep in small bins in drawers. Decide on an organizational system for items that need to remain on your counter. I have found that Mason jars work really well for keeping smaller, loose items organized on my counter. I make sure to label them and keep them clean. I also have a beautiful tray that I keep on my counter to hold perfumes and such toiletries. Consider your wall space – can you clear things off your counter and mount things on walls? Soap dispensers and toothbrush holders work well mounted on walls. If you can’t use mounted holders, a shelf may work well. You can put those Mason jars on a shelf and clear even more space off your counters. What other tips can you give us to keep the clutter off your bathroom counters? Ugh! Bathroom counters are the WORST in my home. They seem to gather everything and are always full of just crap. I clear them off and in 30 minutes they are full of everything again – hairbrushes, toothbrushes, perfumes, hair pins, razors, lotions, shaving cream, and just on and on. This is a never-ending chore. I hope you found some tips you can put to use! YES! In our apartment we had a doubles sink with a relatively large counter, and man did we fill it up! Our new house has a much smaller vanity and just the one sink. We decided on Day 1 that the only things that would live on the counter are handsoap and a water tumbler, because there simply isn’t the space to clutter up! Good plan! We have a huge bathroom counter and lots of kids, so it is very easy to fill up! I finally have my bathroom counters under control, but now I need to tackle the cabinets underneath the sinks! I’ll bet I could toss a good 50% of what’s in there. Now to find the motivation to do it! I so need to do this. My bathroom counters are a constant mess. Thanks for the helpful tips! I love this challenge! I already try to keep our countertops clutter free but need to do it some more nd a pretty tray is such a good tip I use two in our bath! Great tips! I like to keep cotton rounds, cotton balls and things like that in mason jars too. It allows for easy access and it looks cute! I was looking through my medicine cabinet (where I just keep hair/skincare products and things like that) and realized I need to go through and toss old products that I haven’t used in awhile.